A GP said Quirke was “upset” at Mary Lowry’s relationship with Bobby Ryan. 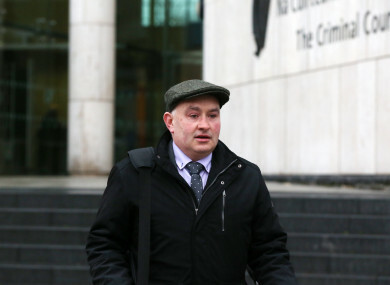 A DOCTOR PRESCRIBED Patrick Quirke on a course of anti-depressants to help him sleep after he complained of being stressed over his affair with Mary Lowry, the Central Criminal Court has heard. Tipperary General Practitioner Dr Ivor Hanrahan said Mr Quirke, who is on trial for the alleged murder of Bobby “Mr Moonlight” Ryan, was “upset and quite hurt” about Lowry’s relationship with Ryan. Mr Quirke (50) of Breanshamore, Co Tipperary has pleaded not guilty to the murder of part-time DJ Bobby Ryan. Ryan went missing on 3 June 2011 after leaving his girlfriend Mary Lowry’s home at about 6.30am. His body was found in an underground run-off tank on the farm owned by Lowry and leased by the accused at Fawnagown, Tipperary 22 months later in April 2013. The prosecution claims that Quirke murdered Ryan so he could rekindle an affair with Lowry (52). Dr Hanrahan today told prosecution counsel Michael Bowman SC that Quirke came for a routine consultation in September 2010 and mentioned a number of work and financial “stressors” he was dealing with at the time and that he was having difficulty sleeping. The doctor suggested medication but Quirke wasn’t keen, so the doctor referred him to a counsellor. Around mid-September, Dr Hanrahan received a phone call from the counsellor and as a result of what he heard he prescribed Mirtazapine, an antidepressant, to Quirke. He said he primarily prescribed the drug to help Quirke’s sleep which was disturbed. In late 2010 and January 2011 the doctor had a number of phone conversations with the accused over a ten-day period and prescribed a number of other medications to help with sleep disturbance. He said Quirke remained upset and distressed and had other issues which he didn’t want to discuss. Dr Hanrahan suggested a face-to-face consultation which took place on 3 February 2011. They had a long consultation during which Quirke told the doctor that he had been having an affair with Mary Lowry, his wife’s sister-in-law, which was a source of stress and upset to him. Quirke asked the doctor not to make a note of the conversation so the doctor wrote in his file only that they discussed a confidential matter. By the time this conversation took place, he said Quirke had stopped taking the medication as it didn’t seem to have helped him. They discussed the impact of the affair on Quirke’s mental health and well-being. From what Quirke told him, the doctor believed that the relationship had at that point come to an end because she had started a relationship with another man. He said his understanding was that Quirke still had feelings for Lowry and “was quite hurt and upset that she had become involved with somebody else”. The doctor further explained that he prescribed antidepressants rather than sleeping tablets as people can become addicted to sleeping tablets. Under cross examination, he told defence counsel Bernard Condon SC that there are two kinds of depression, one brought on by a stressful life event and the other in the absence of a particular event. He said he felt in Quirke’s case he was suffering from adjustment disorder which can be a consequence of a stressful life event. He said Quirke may not have met the criteria for depression. The doctor agreed with Condon that Quirke may have thought he had been diagnosed with depression because of the medication he had been prescribed. However, the doctor repeated that he had prescribed the medication “mainly” to treat sleep disturbance. Breda O’Dwyer told Bowman that she works as an artificial insemination technician and worked with Quirke’s cows for about 15 years. She had an understanding with Quirke that she would call to his farm every morning unless he texted her telling her he didn’t have any cows bulling. By the time she arrived at his farm, she said, Quirke would normally have finished milking and the milking parlour would be cleaned and he would be on his way for his breakfast. He would leave a post-it note for her with the details of any cows that needed to be inseminated that morning. On 3 June 2011, the day Ryan went missing, she said that as far as she could recollect Quirke was still in the pit milking his cows when she arrived. The time would have been “9.30 anyway” she said. The witness told Bowman she referred to her diary previously when gardaí asked about what happened that day and discovered that she inseminated two heifers that morning. Under cross-examination, she told Condon that she no longer has that diary and when gardaí asked her for it she could not find it. In her direct evidence she told Bowman that the insemination would have taken about 15 minutes and Quirke was still in the pit as she left. The witness also said that Quirke texted her that morning at 7.24am but she doesn’t know what the text was about. She said normally if he were to text her in the morning it would be to tell her he had no cows and if he had no cows she would not call. She said she spoke to Quirke about the discovery of Ryan’s body. She said she “wasn’t going to talk to him about the weather” when there were stories in the newspapers. They would have a “general conversation” about it, she said. She remembered one conversation in which Quirke asked her did she remember that Sean Dillon – a youngster who worked on the farm at the time – was with him that morning of 3 June 2011. She said she didn’t see Sean there but that doesn’t mean he wasn’t there. He could have been somewhere else on the farm, she said. She explained that she no longer has the diary as she is only required to keep it for between one and two years. The witness explained that she had the diary in June 2013 when she checked it to see if she had gone to Quirke’s farm that day. Gardaí came looking for the diary six months later but she couldn’t find it then. She denied that she could be mistaken about seeing Quirke milking cows on 3 June. She said the time she would arrive at Quirke’s farm does not vary much but it could vary sometimes. He would normally, she said, be first or second on her list of farms to visit. Sean Dillon told David Humphries BL for the prosecution that he worked on Quirke’s farm from the age of about 7. He was 14 in June 2011. The day after his school holidays began that month he was working on Quirke’s farm and moving bales on his own family farm a few minutes drive away. Milking usually finished around 9.30am, he said, but he agreed with Condon that the times could vary if cows were further out in the fields or if other jobs needed to be done. When he heard about Ryan’s body being found in the tank at Fawnagowan he said he was frightened by it. He had been working close to it not long before. Justice Eileen Creedon told the jury of six men and six women that they are not required tomorrow but will be required on Friday. Email “Doctor gave Patrick Quirke anti-depressants after he claimed he was stressed over affair, court told”. Feedback on “Doctor gave Patrick Quirke anti-depressants after he claimed he was stressed over affair, court told”.